As a freshman in college (incidentally the ONLY year Aaron was in college!) he was short on funds for Christmas gifts, so he looked into ways to make money. This recycling business and Thoreau quote taught Aaron an incredible lesson that lead him into a lifetime of entrepreneurship. It was a great experience in seeing a business that didn’t exist turn into a business that made thousands of dollars a month. When you get some initiative and look for some niche that is needed, you will find success. Doing something that doesn’t always make a lot of sense to others yet is clear to you takes courage. Even if it comes naturally in your mind of the big picture, others may not understand nor will they comprehend your vision. It’s when you put it into action and then show results that those doubters can then see. Don’t fear your own brilliance and ability to succeed. Whatever your dream is, aim high, write it down, articulate your dream to people as you meet them. The more specific you are with your dream, it’s critical that you advance confidently in the direction of your dreams and you end up living a life that is at a higher level. It’s just the way that it works. Know what you want, figure it out in exquisite detail. Make the dream come true on paper and then proceed forward. It works.Every.Single.Time! Welcome to The Lookout Society Podcast, where Aaron shares a story from his life, then connects it with a business principle to pass on. This is his way of helping others that are also going down an entrepreneurship path as contributing members to society. As an added bonus, Aaron shares wonderful gems in each episode of Oregonian knowledge from his home state and weaves the passion he has for the community he lives in as an invitation for others to visit the Pacific Northwest. Don’t let fear keep you from seeing your own brilliance and ability to succeed. Write down your dreams. 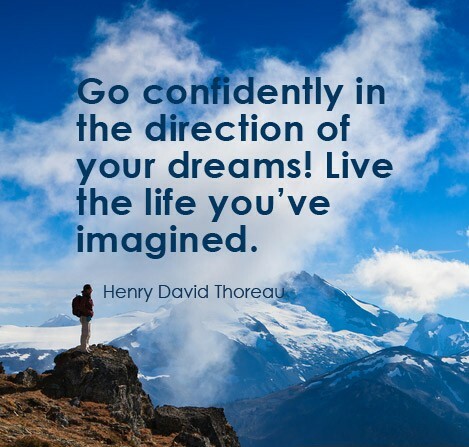 Thoreau was one of the great transcendentalists during the 19th century that pioneered many of the ways of thinking to turn back to nature, similar to the medicinal approach to homeopathic ideas that we currently see trending today. I recently came upon Les Brown’s speech “It’s possible!” as a motivating guide to allow our brilliance to shine!